3. 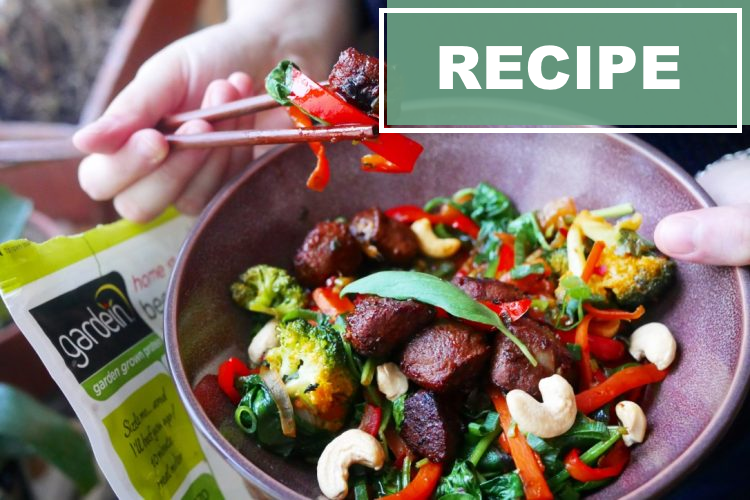 In a non-stick pan over medium heat, sauté gardein beefless tips in vegetable oil for 4-5 minutes caramelizing well on all sides. Add 1 teaspoon of brown sugar and a bit of soy sauce. Remove from pan and set aside. 4. Add onions, garlic, ginger and sambal oleak. When its caramelized add carrot, broccoli, red pepper and scallions to the pan and cook until onions are caramelized and carrots and broccoli are soft, approximately 10 minutes. Add soy sauce and sesame seed oil, cooked beefless tips, and spinach and cook until sauce has thickened and spinach has wilted.